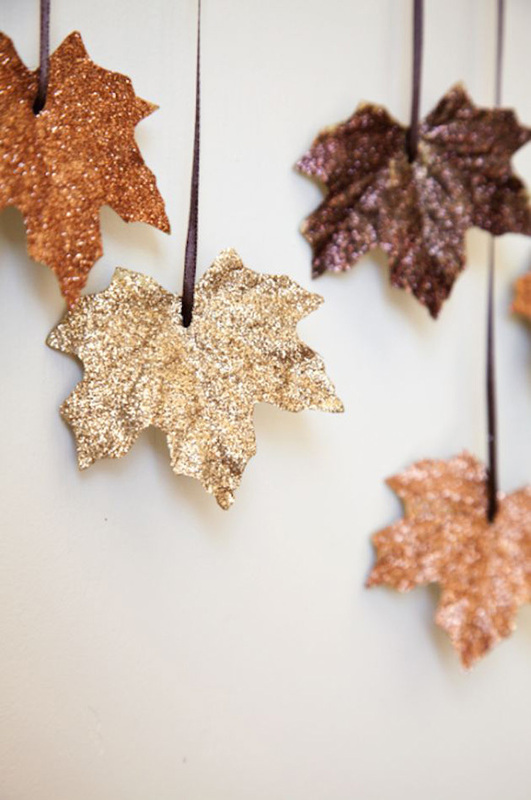 You’ll need a steady hand to pull of these autumnal decorations but the end effect is worth it. These would look awesome used sparingly on a table plan. Lace ribbon through each leaf so that you can hang them, and spray with a fixative like Winsor & Newton Fixative (£9.29), Amazon. Be still our beating hearts “ sequins are back with an almighty bang! Our friends in the USA have been rocking this trend for a while now and it’s made its way across to us Scots. 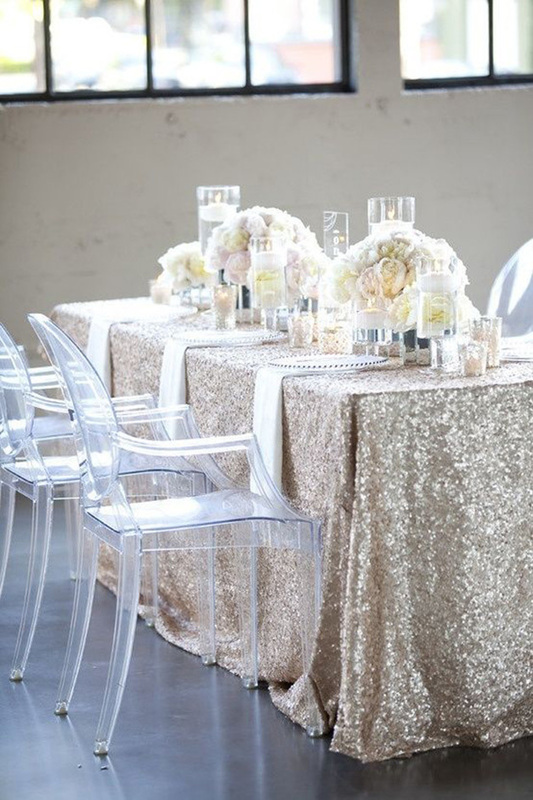 Sequin table runners are perfect for long or round tables or, if you want a real touch of glamour then go for a full sequin tablecloth. Tone it down a little by swathing just a sweetheart top table or cake/dessert table in the sequins. We’re in love! 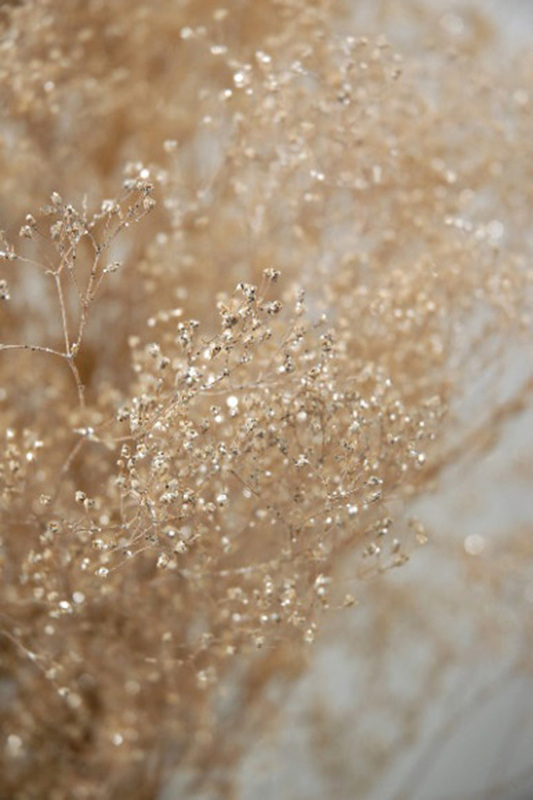 As if it wasn’t pretty enough already, this bunch of Baby’s Breath has been sprayed with a shimmering gold paint; dead simple and easy, and cost effective too! It totally changes the atmosphere created by the flowers from vintage and pretty to glamorous and gorgeous (although if you mix up the white with the gold you get a lovely effect too). Not normally a huge fan of balloons (bit too birthday for us! ), we were surprised when we saw these ones and immediately wanted them! 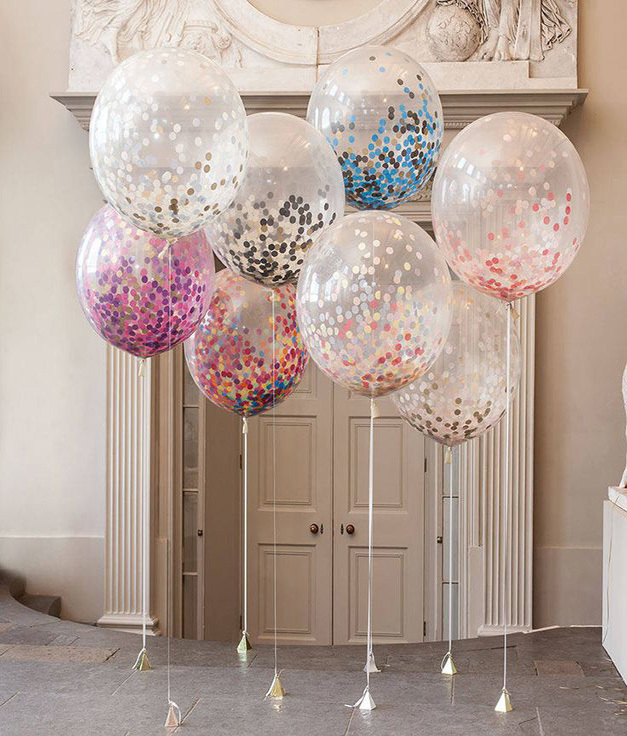 Unique and special, these latex balloons (£12 each) from Bubblegum Balloons are clear, round and filled with giant circular confetti. The top tip is to fill the balloon with air and helium to stop the confetti from sinking to the bottom. These make a real impact on any reception space. These invitations are understated but really pack a punch, and add a sense of occasion when they land on your guests’ doormats. 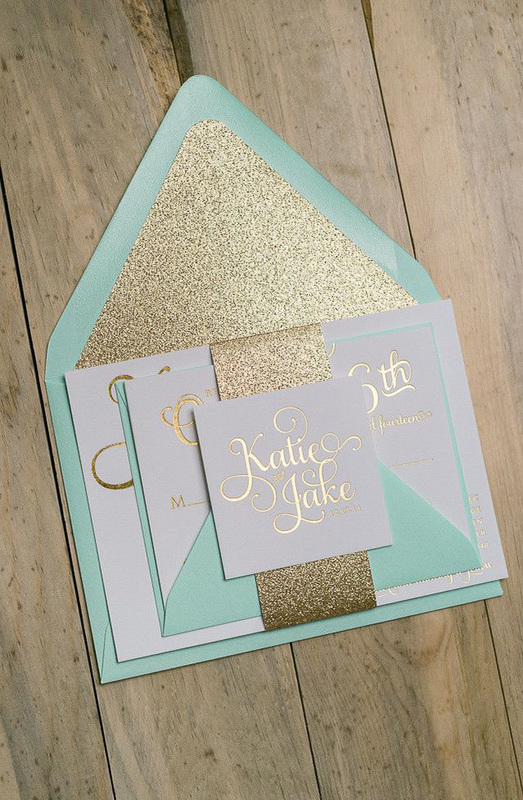 Adding just one glitter strip really ties everything together and the glitter-lined envelopes are just gorgeous. 6. SPARKLY SHOES TO DIE FOR! 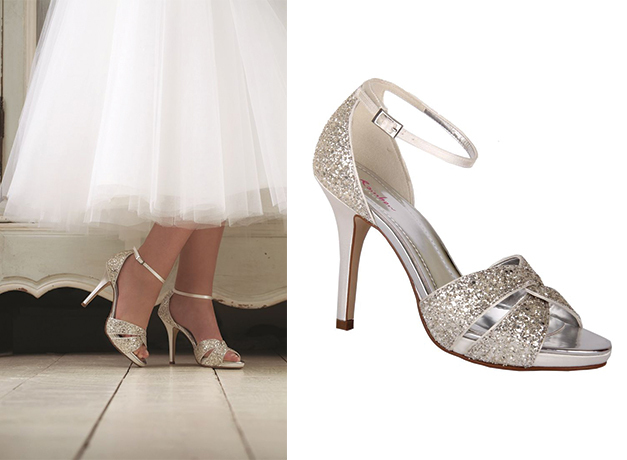 Does anything make you feel more princessy and gorgeous and just totally glam than a pair of sparkly shoes? These amazing ˜Charlotte’ heels (£85) from Melle Cloche in Glasgow will be the star of the show. Wear them with a shorter gown for the full effect (or be warned “ you’ll be hitching your dress up all night to show them off!). Your bridesmaids will love this Art Deco Beaded Dress (£240) by Adrianna Papell so much, they’ll wear it again and again! It’s such a gorgeous gown without being garish, and will complement a more traditional bridal get-up just perfectly. Pare down the accessories and go for simple, slick hair and make-up for the full glam effect. This Large Glitter Hair Bow Clip (£15) is such a gorgeous change from a diamante or pearl headdress or clasp “ don’t you think it works beautifully in this model’s blonde hair? If you don’t think it’d work for your bridal look then why not have your bridesmaids wear one? Gold goes beautifully with navy blue for a winter scheme with a difference. 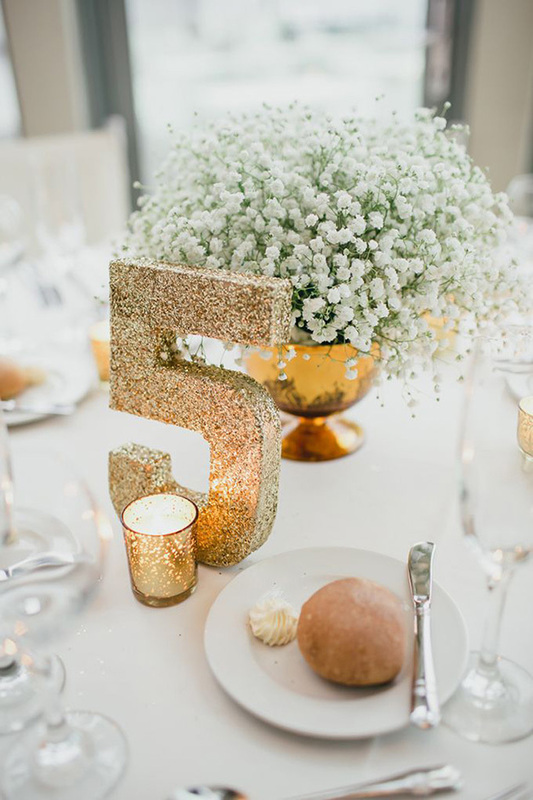 Just the right amount of sparkle for a table centre, why not have 3D numbers instead of table names? Not only does it eliminate the argument about what you should call each table (no, we are NOT calling them after the 1991 Motherwell Scottish Cup Winners team), but it also looks totally cool and chic “ kind of like having a table in a really exclusive restaurant. Tealight candles make the glitter really pop too. 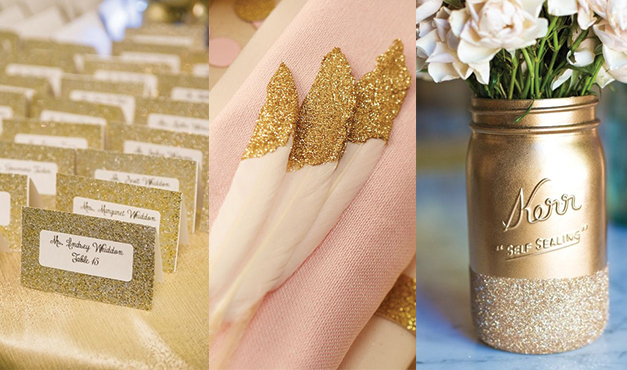 If you’re a bit scared to go too full on with your glitz then pare it down by adding a few subtle touches: gorgeous place names, glitter tipped feathers (an SWD favourite) and mason jars painted gold and dipped in glitter, which look amazing on centrepieces. 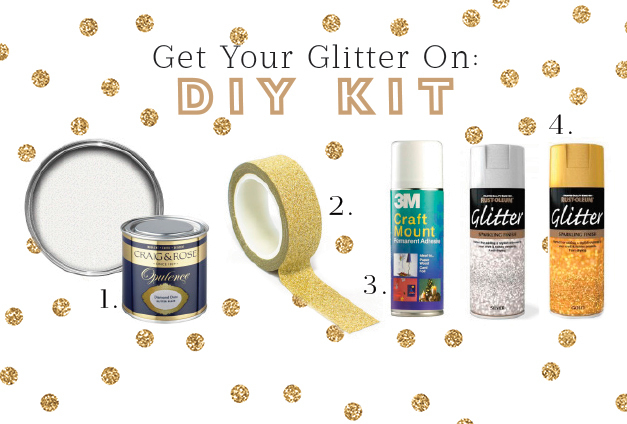 Pick up a few things to help you with your glittery DIY adventures! And take it from us, you’ll want to cover all surfaces and floors that you’re working on “ it’s gonna get glitzy! 1. Glitter Paint (£9.50), Craig & Rose. 2. 5m Glitter Washi Tape (£2), Etsy. 3. 3m CraftMount Spray Adhesive (£5.53), Amazon. 4. Glitter Spray Paint (£9.49), Homebase. TOP TIP: If you’re using a lot of glue and aerosols, make sure you wear a protective face mask. You can pick them up from eBay really cheaply.